SPECIAL OPENING PROMOTIONS: BOOK NOW to avoid disappointments. Hotel like Quality & Standards at Hostel prices. If you are looking to stay at Singapore in a good quality, clean, friendly place at budget prices, Mitraa INN is the right answer ! 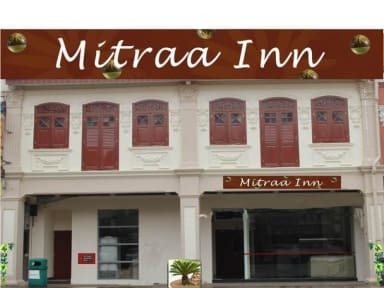 Located in the edge of Singapores popular tourist district of Little India, Mitraa INN is closer to the famous 24 hrs Mustafa Shopping centre, 24 hrs food courts, the Farrer Park MRT Train station - the accessible and easy transportation to explore the city and a bus stop right at our door steps. If you are looking to meet and socialize with other friendly travelers, you can choose from 4, 6 or 8 bed dorm rooms, mixed or female only. If you are with your family, you can select the 3 or 5 bedded Private rooms. Most of our dorm rooms come with Private Bathroom. Access to the rooms is by electronic key card, every bed comes with a safety locker and entire building covered by CCTV camera surveillance, so do not worry about safety. To avoid climbing stairs with your luggages, the hostel provides Lift facilities. We are a family friendly Tourist Hotel and not a Party hostel but we offer a friendly & relaxed accommodation. A common room with plasma TV, DVD, board games & mini library is available for you to relax. FREE high speed Wi-Fi available throughout the building. Our mini dry kitchen has a microwave, toaster, fridge and hot water pots. To help you get around we got a book exchange, FREE Maps, free access to Travel guide books. A simple breakfast of toast, butter, jam, fruits, eggs, coffee & tea is provided FREE. Free Luggage storage on day of arrival & check-out is provided. Our reception is open 24 hours and there is no curfew. Luggage storage is available for early arrivals or late departures on the day at no extra cost. Please note the balance amount is payable in Cash only and we do not accept payment of Credit card. Great staff, free toast and fruit for breakfast, clean and comfortable beds. The bathrooms and showers were okay, clean enough. Lockers were a struggle to close, but could manage. Located in 15 minute walking distance from 2 train lines. Great staff and good location for food (great indian places as it is located in Little India). Close to the MRT and clean rooms. Get what you pay for, not 5 star, but not bad by a long shot! All the staff is very accomodating. No real atmosphere as my room was full of Asian people being in Singapore for work. The rest were mostly Asian families. Staff was super friendly, they really look after you. My dorm room (without windows) had six beds with six lockers of which only four could actually be locked (all of which were already taken) and only four power sockets, none of which was anywhere close to my bed. I was located on one of the upper beds with very little space between mattress and ceiling (uncomfortable). Staff were friendly, bathrooms and toilets were smelly, cleanliness is a bit of an issue - saw a little cockroach. They have a mini supermarket at the reception which is cool. Be aware this is a shared gender hostel with no bed having curtains for individual privacy and the bunk beds squeak quite loudly as you climb up and down, which can disturb your fellow roommates as they sleep. Overall, this is your typical hostel, which is reflective in the cheap cost. Location is only 5min away from MRT. The staff on the front desk were lovely. However this place is full of Asian workers and it’s quite off putting when you want to socialise. I think the pictures are outdated and the rooms are cramped and old. The cleanliness is fine, warm showers. Being a female, it wasn’t great sharing a room with 7 other guys, mainly Asian men, over 40 who were there on business. I wouldn’t recommend staying here if you’re female and looking to meet friends. The staff was v friendly but the photos are outdated and the place communal areas don't look as it shows,place does not have atmosphere. Location is not that convenient and the internet was unreliable. I won't stay again.